Well ladies, it’s that time of year again: My Halloween costume reveal! Every Occtober I get so excited to get crafty and make a new Halloween costume (homemade ones are always my favorite). Last year I gathered together sequins and seashells and made a mermaid. The year before I gather up a mountain of tulle and made a toothfairy costume. And this year, instead of putting together one Halloween costume, I decided to create a group costume for me and my group of girlfriends. Our vision? Equal parts chic and wild. Without further ado, meet the party animals! 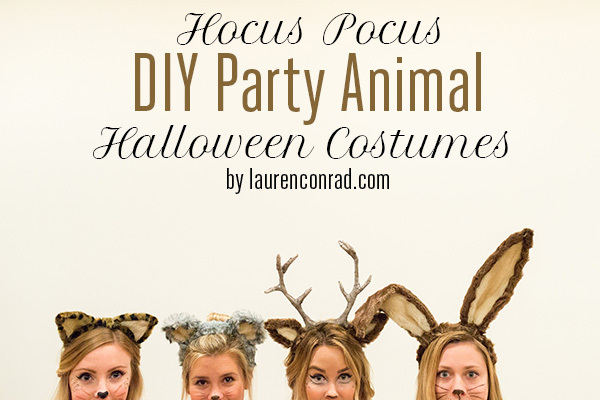 Create the skeleton of your antlers by attaching pipe cleaners to the plastic headband. Twist them together to make them study and continue to add more as you move up. You can make them as small or large as you would like. Cut your brown paper bag into small strips. Pour the Mod Podge into a bowl and mix with water (1 part modge podge and 1 part water) to make dipping your strips into the glue easier. Dip each paper strip into the Mod Podge mixture and wrap them around the pipe cleaners. To speed up the drying process, I set my antlers in front of a blow dryer. If you aren’t in a rush leave your antlers to dry overnight. Once your paper mache antlers are finished drying, begin painting them. I wanted a more rustic look, so I mixed dark brown and white to make a pretty, distressed look. Let your final product dry before you attach the ears (keep reading for directions on the ears!). Begin by cutting out the large outer shapes of the ears using the dark faux fur. Cut the smaller center of the ears from the lighter faux fur. With your hot glue gun, glue the lighter faux fur to the center of the dark faux fur ears. Bend the wire to match the shape of the larger ear, making sure to leave a little extra at the end. Fold the faux fur over the wire and glue into place. Hold the faux fur in place for a few second so that the glue can fully dry. With the extra wire at the bottom of each ear, wrap it around the headband just below each antler. Similar to the instructions for the deer ears above, cut out two large bunny ear shapes from the dark faux fur and two smaller ones from the lighter faux fur. Cut out strips of wire and bend them into the same shape as the bunny ears. Secure each piece of wire with hot glue. Fold the faux fur over the wire and secure with hot glue. Make sure each ear is completely dry before securing it to the headband. With the excess wire at the end of the ears, secure each ear to the plastic headband. Cut out longer strips of dark faux fur and glue them to the headband, covering the entire thing. Cut out two circles of light faux fur (I cut out an almost bowtie shape to save myself a little time). With your needle and thread, sew your two circles together. When you’re almost finished sewing the two circles together, leave a little opening. Stuff the tail with any extra faux fur scraps that you have lying around. You can even use tissue or cotton balls for this step. Sew the rest of the tail together and secure onto your costume with a safety pin. My team and I completed these same steps to create a mouse and cheetah costume as well. The process is exactly the same, just be sure to cut out rounded ears for your mouse costume and pointy cat ears for your cheetah costume. Voilà! 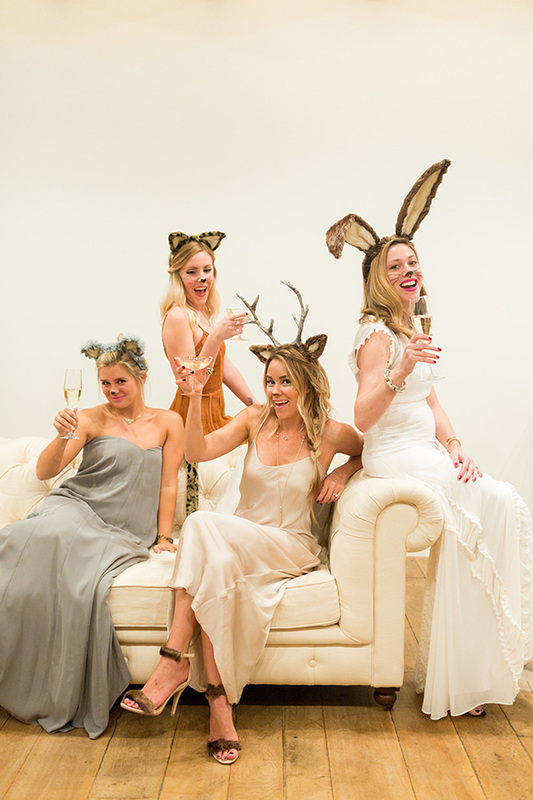 To complete our “party animal” costumes, my team and I dressed up in party dresses and stacked on some jewels. And let’s be real… No party would be complete without a glass of champagne. So… What do you think of the end result? 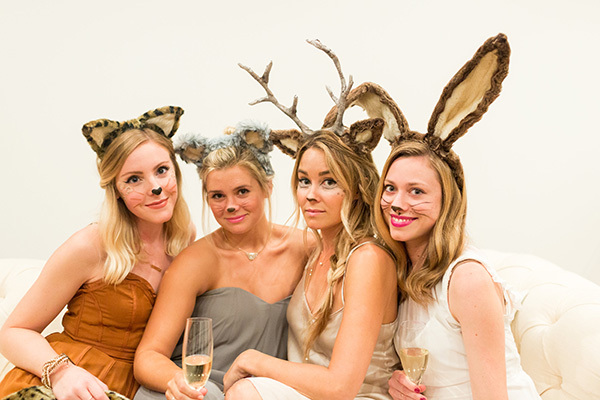 Will you be recreating these costumes with your friends? I can’t wait to wear these costumes again next weekend!